Steve Hansen expects to see the 25-year-old play for the All Blacks ‘for years to come’ after he opted to stay with the Hurricanes. Laumape has played 10 times for the All Blacks. Laumape made his Test debut against the British and Irish Lions in 2017 and has gone on to make 10 appearances for the world champions – scoring a hat-trick against Japan last November. All Blacks head coach Steve Hansen welcomed Laumape’s decision to remain in his homeland, with the Rugby World Cup in Japan on the horizon. 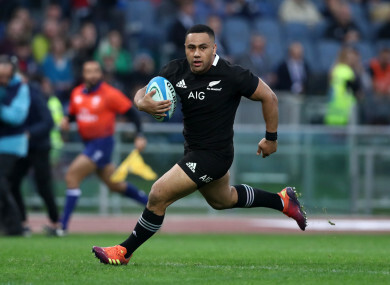 “Ngani is part of a crop of outstanding young All Blacks who are taking their opportunities on the international stage, and we congratulate him on his decision,” said Hansen. “To get Ngani committed to being at the Hurricanes until 2021, so soon after Dane Coles also announced he was staying, it’s more great news for us,” said Plumtree. Email “All Blacks centre Laumape rejects overseas interest to sign new Hurricanes deal”. Feedback on “All Blacks centre Laumape rejects overseas interest to sign new Hurricanes deal”.